This week, temperatures in Chicago dipped to -16 degree Fahrenheit (-26.7 degree Celsius) on the heals of the frigid, dense air known as a polar vortex, which has swept across the Midwest and through huge portion of the United States. 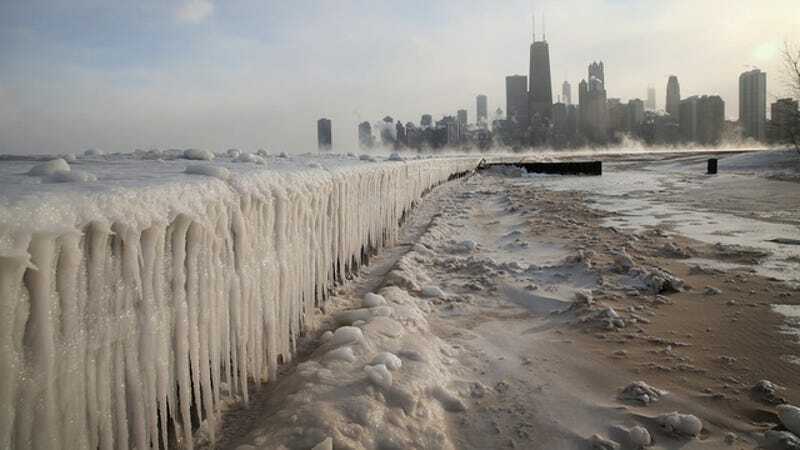 The freezewave brought dangerously cold temperatures, colder than any seen for 20 years, and transformed the Chicago shoreline along the Lake Michigan into what would be an icy fairy kingdom—if it weren't so deadly cold. Here's our photo collection, straight from the heart of the ice. Mist rises from Lake Michigan at North Avenue Beach. Chicago firefighters transport a woman to an ambulance following a minor commuter train accident in the Loop. This is not how you should protect your smartphone in cold weather. Commuter makes a sub-zero trek to office in the Loop. Ice builds up along Lake Michigan at North Avenue Beach. A Chicago flag with snowflakes instead of stars is displayed on the back of a newspaper vending box. Hit by a polar air mass. Commuters arrive at the La Salle Street commuter rail station. Wind chills are expected to reach 40 to 50 below. Commuters make their way across the Chicago River. Big chunks of ice along Lake Michigan. A person runs along Lake Michigan in temperatures well below zero. The bitter weather comes after a heavy snowstorm hit much of the region last week. A blanket of fog covers Lake Michigan. A Delta plane is de-iced at Chicago Midway International Airport. More than 400 flights were cancelled at Chicago's airports on Monday. This satellite image shows the entry of a large area of low pressure, from the Polar Vortex, into the Northern U.S. January 6, 2014. The weather system is expected to move northward back over Canada toward the end of the week. Have your own icy photos? Drop them in the comments below!